A glow in the dark party can be some of the most fun children have ever have. Kids love parties. Kids love things that glow in the dark. It’s already a match made in heaven! There are many different things that you can do to make your glow in the dark party even more memorable. 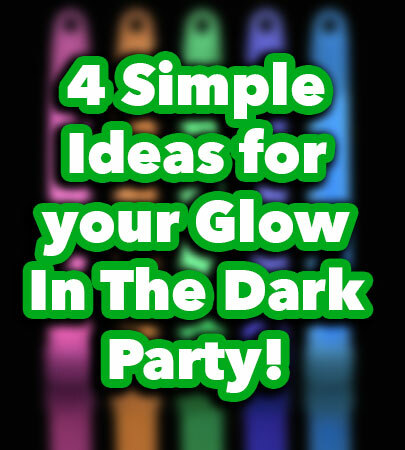 Here are four easy-to-do glow in the dark party ideas. Easter is usually a great day for a kids party. However, a glow in the dark Easter egg hunt is a fabulous idea. Easter egg hunts are already loads of fun during the daytime. Transitioning to a night-time Easter egg hunt is sure to be very exciting for the kids. For one, you want to make sure that you are in a relatively safe place. Backyards are nice; parks are even better. Make sure there are plenty of adults around. For additional safety, give kids glow sticks to wear around their neck. As a bonus prize, fill the eggs with small, glow in the dark treats! Ninja is a very fun games that’s usually played in theatre classes. It’s usually played in a dark room and it is played in slow-motion. The idea of the game is this: Each of the players is a ninja that has blades on their forearm. Their goal is to defeat the other ninjas by hitting them (softly!) with their blades. What makes this game fun is that all of the players have to move in slow-motion. It’s a lot more difficult than it sounds. Making the room pitch-black and taping glow sticks to the children’s forearms makes this a very cool looking game to play. If you have a pool, this is an absolute must. Swimming during night time is already fun enough. Swimming in a glowing pool just makes everything even better. Not sure how this works? Just crack a bunch of glowsticks and throw them into the pool. They water resistant so you won’t have to worry too much about the liquid seeping into your pool. When you throw enough in, the entire pool is going to be illuminated by all sorts of different colors. As far as glow in the dark party ideas go, this is going to be one that the kids will always remember. It’s going to take a while to pick all of the glow sticks out of the pool, but it’s definitely going to be worth it. For those who are hosting more active kids, glow in the dark sports should be a no-brainer. There are all sorts of different illuminated sports balls that you can get. From footballs to ping-pong balls, the Internet will have you covered. Ping-pong or table tennis can be an extremely popular choice. Outlining the racket with LEDs or glow sticks and using an illuminated table tennis ball increases the challenge and just looks downright awesome when the kids are playing it. All in all, there are many different cool ideas that you can try at your next glow in the dark party. No one says you have to do all of these at once. Save some of the better ideas for your later parties. The kids will appreciate it very much!